The PAC1921 is a dedicated power-monitoring device with a configurable analog output that can present power, current or voltage. All information is also provided on the 2-wire/I2C© compatible interface. 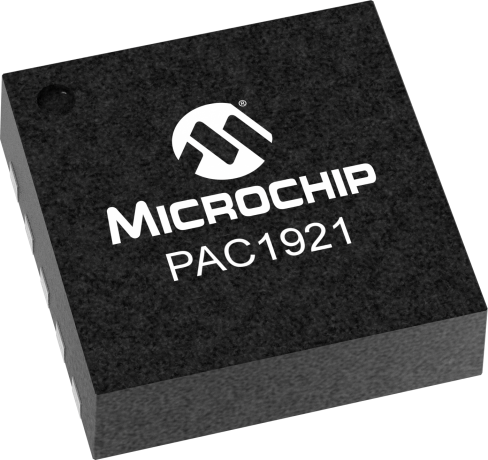 The PAC1921 is designed for power measurement and diagnostic systems that cannot allow for latency when performing high-speed power management. The device is 0.4% accurate for current readings and 1% accurate for power readings. Measurements are accumulated in large registers, allowing for integration periods of 500 μs to 2.9 seconds. The measurement is averaged and presented on the analog output with a full scale range of 3V, 2V, 1.5V, or 1.0V. The PAC1921 has a READ/INT pin for host control of the measurement integration period. This pin can be used to synchronize readings of multiple buses between several devices. Data sampling and output attributes, such as the internal ADC resolution (11-bit or 14-bit) and sample rate, are configurable. The device can monitor power rails from 0-32V with a full-scale capability of 100 mV across the sense resistor. No input filters are required for this device.